/ Blog / Portugal’s Startup Ecosystem is now a force to be reckoned with! SEP releases first research into the Portuguese ICT Scaleups and Exits ecosystem, published with the support of Microsoft Portugal and Ativar Portugal Startups. 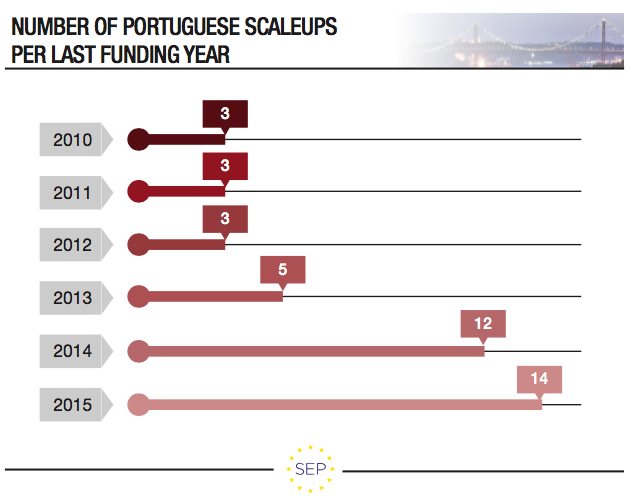 Despite its relatively recent history, 40 scaleups (startups with >$1M funding raised since foundation and at least one funding round in the last 5-year period) have been identified by SEP in Portugal. They have cumulatively raised over $166M from venture capital since inception, with an average of $4.2M each. 24 other companies have been able to secure funding in the range of $0.5-$1M. The greatest number of Portuguese scaleups (42% of the total) are located in Lisbon and account for about 60% of the total money made available to Portuguese scaleups. 28% are based in Porto. The remaining are scattered all over Portugal. From the “exits” side, 9 M&As have been reported in the last five years, about ten times less than the average of the other five countries previously analyzed by SEP (UK, Germany, France, Italy and Spain). They all exited internationally. In the same period, no Portuguese ICT company went public (IPO). The vast majority (90%) of Portuguese scaleups are small scaleups and fall into the $1M-$10M category of capital raised (they collected 44% of the total amount of capital raised). Over half of the total capital made available to Portuguese scaleups has been raised by the mid-scaleup segment ($10-$50M). 4 companies secured 56% of the overall capital raised. No scalers (i.e., scaleups able to raise over $100M raised) nor Unicorns (companies valued over $1B) have yet been spotted in Portugal. However it’s worth noting that one European unicorn has Portuguese blood in its veins: Farfetch, is a UK company founded in 2008 by the Portuguese entrepreneur Josè Neves. Several Dual Companies (headquartered abroad but maintaining a strong operational presence in Portugal) have been detected and continue to invest a large part of the capital raised in their home country. The most notable are Feedzai, Talkdesk, Veniam, Unbabel and Musikki. Rising from the late-2000s financial crisis, Portugal is rapidly emerging on the European startup map. Although it can’t yet be compared with other leading countries previously analyzed by SEP (UK, Germany, France), it does however share some of the same similarities. Lisboa, November 27th 2015. 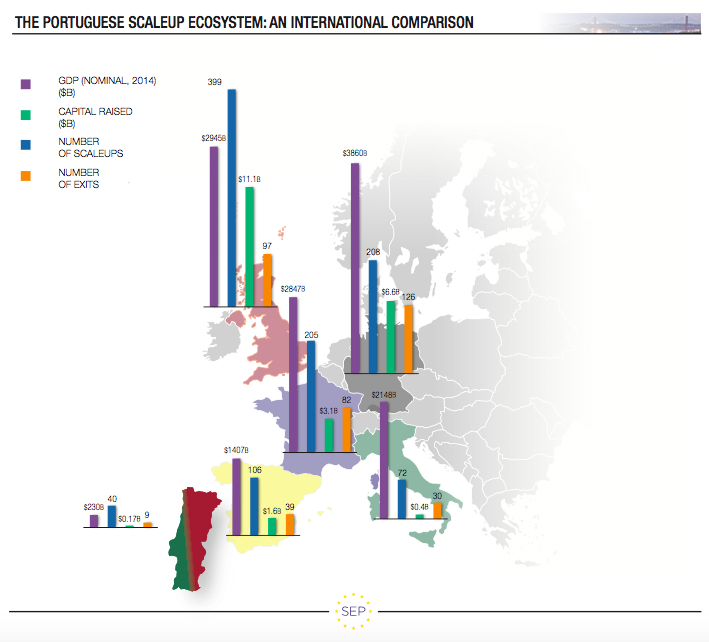 — Startup Europe Partnership (SEP), in collaboration with CrESIT, today published its new Monitor focused on the Portuguese ICT scaleup ecosystem. This Monitor has been produced with the support of Microsoft Portugal and Ativar Portugal Startups and will be showcased later in the day at the UP Awards, an event that will bring together the entire entrepreneurial ecosystem in the country. The study shows that Portugal is rising from the late-2000s financial crisis and rapidly emerging on the European startup map, with a very vibrant entrepreneurial community able to produce tangible results, despite its relatively young history. Although it can’t yet be compared with the leading countries previously analyzed by SEP (UK, Germany, France), Portugal does share many of the same similarities – and a smaller gap – with Spain and, particularly, Italy. SEP identified and analyzed 40 scaleups (startups that raised over $1 million) that broke the early-stage level and cumulatively raised over $166M from Venture Capital, with an average of $4.2M each. To properly assess the Portuguese data, we need to factor in the relative newness of the Portuguese startup ecosystem: 65% of the Portuguese scaleups had a funding round in the last two years (the majority of which was raised this year) and 75% were founded after 2010 (and 48% after 2012). In addition, Portugal is a relatively small sized economy compared to the other countries analyzed (Portuguese GDP is $230B, 16 times lower than Germany, about 12 times lower than the UK and France, 9 times lower than Ital y and 6 lower than Spain). 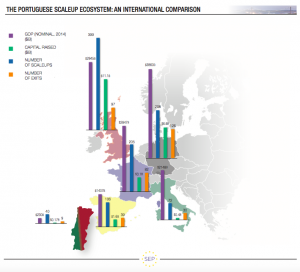 In this respect the Portuguese scaleup landscape looks very similar to that of Italy – and to a lesser extent to Spain – with a large dominance of small scaleups. The vast majority of Portuguese companies (90%) that have actively raised funds in the recent years fall into the $1M-$10M category of capital raised and account for 44% of the total amount. 8% fall into the $20-50M range and collected 48%, 2% fall into the $10-20M range and raised 8% of the total capital. As a consequence, over 50% of the total capital made available to Portuguese scaleups has been raised by the mid-scaleup segment ($10-$50M). No scalers (i.e. $100M raised) have yet been spotted in Portugal. It is not unexpected that Portugal currently lags behind in terms of exits. The SEP Monitor identified 9 M&As, with an average of two transactions per year in the last four years (3, 1, 2 and 3 acquisitions respectively in 2012, 2013, 2014 and 2015). This number is about ten times smaller than the five-country EU average (75), and still far from the other two Mediterranean countries (Italy has 30 exits, while Spain recorded 39 exits). No Portuguese ICT company has gone public in the last five-year period. All Portuguese scaleups exited internationally. The large majority of the deals (66%) were completed by U.S. buyers, while 22% of the acquisitions were by companies from other EU countries (Spain and UK), and none by a Portuguese company. One acquisition was from a South African company (Naspers). This data suggests that the Portuguese startup ecosystem is internationally well connected, while the domestic corporate market is not yet exploiting the opportunity of investing into startups. The greatest number of Portuguese scaleups (17, 42% of the total) are located in Lisbon. And in Lisbon it looks easier to get access to venture capital: the companies based in the capital city raised about 60% of the total money made available to Portuguese scaleups. 11 scaleups (28%) are based in Porto. This makes it the second scaleup hub in Portugal. The remaining scaleups (12) are scattered all over Portugal, with a larger concentration in the north and specifically in the area surrounding Porto and Braga. Software Solutions, Business Analytic s and Health respectively account for 17% and 13% of all the scaleups mapped in Portugal. Education, Enterprise Services, Hospitality and Mobile equally attract 8% of the identified companies. Other areas such as Cleantech, Digital Media and Fashion are attracting more scaleups (5% each). As reported in other European countries such as France and Italy, the SEP Monitor detected a number of Dual Companies (domestic-born and grown-abroad), i.e. Portuguese startups that relocated their headquarters – and with that part of their value chain – abroad, while maintaining a strong operational and technological presence in the country of origin. Feedzai and Talkdesk, for instance, moved their headquarters to the US where they raised post-seed capital from US investors. Other interesting dual model examples include Veniam (initially founded in Porto in 2012, the company is now based in Mountain View with engineering labs in Portugal), Unbabel (founded in 2013 in Lisbon, Unbabel is now headquartered in San Francisco, while maintaining engineering in Portugal) and Musikki (launched in 2011, Aveiro-based, is now headquartered in London with operations in Porto). No Unicorns have yet been spotted in Portugal, despite one European unicorn having Portuguese blood in its veins. Farfetch was founded in 2008 by the Portuguese entrepreneur Josè Neves. The company’s headquarters are in London, but most of its technology operations are in Porto where it has more than 1,000 employees. Farfetch raised $195M in five rounds.